The Canadian Arctic (including Hudson Bay) occupies an area of approximately one million square miles of glaciated plain, tundra, islands, sounds, straits, inlets, and passages, which are frozen and choked with ice floes and pack ice for much of the year. For 400 years explorers sought a navigable passage through its archipelago or across its land. 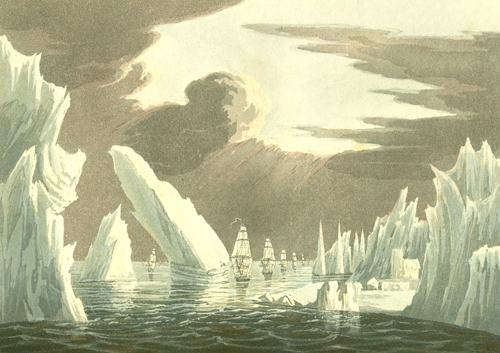 Their story—what historians have cumulatively described as a “quest for a northwest passage”—makes one of the best studies of human exploration of this planet, full of the characteristics that mark all great stories: rich characters, drama and suspense, a harsh but compelling setting, tragedies and triumphs, and a mysterious yet satisfying conclusion and resolution. Much of these explorers’ efforts were surveying and charting activities directed at creating a complete, accurate map of the area. At its heart, then, it is a story “of maps and men.”After Columbus, European governments—but particularly the British who had lagged the Spanish and the Portuguese in maritime exploration—were strongly motivated to find a shorter route to the Orient. In a world where trade meant everything, failure to “discover” and exploit New Worlds guaranteed being left behind. Yet, long after the nonpracticality of navigating frozen northern waters was irrefutably established, the searching continued—for sovereign pride and for scientific and geographic purposes. Toward the end of the last century, a third “phase” or era began in Northwest Passage history, that of the adventure seekers. Like climbing Mt. Everest and solo-circumnavigating the globe, transiting the Northwest Passage had become, and remains today, a formidable goal for those wishing to personally challenge the natural elements—by kayak, by catamaran, as a single woman, in a single season—the variations on the theme seem endless. These “firsts,” however, cannot obscure or diminish the first firsts, achieved without Gore-Tex or GPS, without, alas, even a good map.